Minox makes a variety of compact, small spotting scopes with 50-62 mm objective lenses. 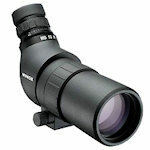 The Minox MD 50 comes with a 16-30x zoom eyepiece; a selection of eyepieces are available for MD 62 scopes including wide angle fixed magnification models of 22, 30 and 40x, and 20-45x and 21-42x long eye relief zoom eyepieces. All Minox scopes are fully waterproof, dust-proof and fog-proof. Some models offer the additional optical quality of ED glass elements.